According to Baert 2001, Emir Hibullah was murdered during a shooting party in 1919. His son Emir Amanullah Khan, proclaimed the independence of the country following a short war against the British, and attempted to modernize the Afghan state. Some of his reforms, such as abolition of serfdom, were accepted, but his attempts to improve the status of women were rejected by the most conservative religious leaders. Amanullah prescribed the first national Afghan flag, showing the new national arms on a black field. On the arms, the mosque, still showing a mihrab and a minbar, was surmounted with the royal shako. Rays forming eight points and inscribing the mosque into a circle were inspired by the 19th century Ottoman Imperial standards. The image in Baert 2001 is similar to the one above. According to Baert 2001, an oval replaced the circle inscribing the mosque in 1921. I just have to add one more image to the set presented by Željko Heimer. This one comes from a photograph published on Flaggenmiteilung no. 72, 2/12/1981. 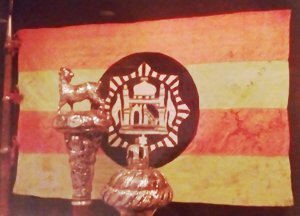 The caption says that this is an Afghanistan State flag, dated about 1920, conserved in the Museum of History of Uzbekistan Peoples in Tashkent; the information was sent by J. Kurasow. The proportions are also indicated, which are ca. 11:15. 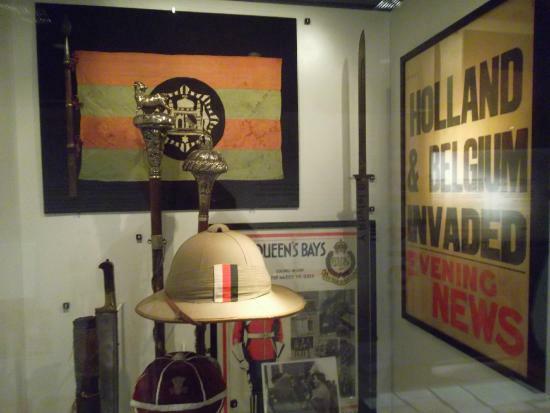 Another photo of this flag can be seen on Trip Advisor, showing parts obscured here. This flag is described at http://afghanland.com/history/flags/flags.html as used in Qandahar as a transitional flag until the adoption of the new [national] flag in 1930.